A step-by-step guide on pairing your Poké Ball Plus to Pokémon: Let's Go and Pokémon GO. If you purchased the Poké Ball Plus peripheral, you may be wondering how to pair the device to Pokémon: Let’s Go and Pokémon GO. By pairing your device, you’ll be able to use the Poké Ball Plus in Pokémon GO similar to the Pokémon GO Plus. In Pokémon: Let's Go, you can use the Poké Ball Plus as a controller. Additionally, by purchasing a Poké Ball Plus, you get a free gift in the form of Mythical Mew in Pokémon: Let’s Go! Wondering how to start the pairing process? We’ve got you covered! Below, we’ve put together a guide on how to pair your Poké Ball Plus to Pokémon GO and Pokémon: Let’s Go! Hit "X" to bring up your Menu, then tap "Y" to bring up Options. 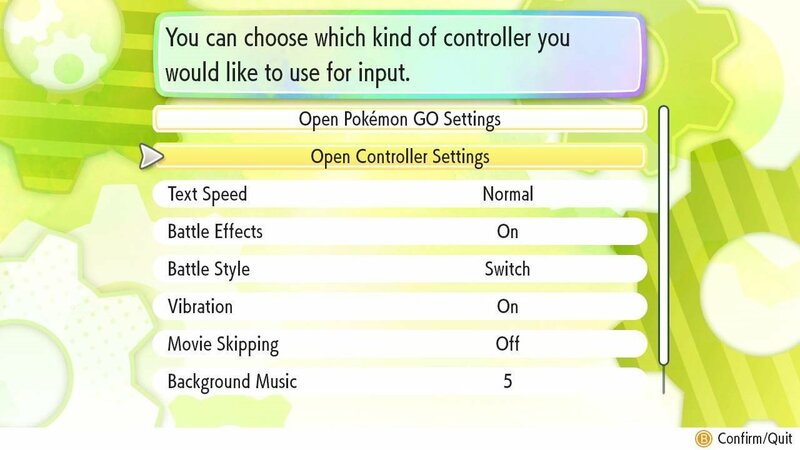 In Options, select "Open Controller Settings" to switch your controller type in Pokémon: Let's Go. There are two ways to approach pairing your Poké Ball Plus to Pokémon: Let’s Go. 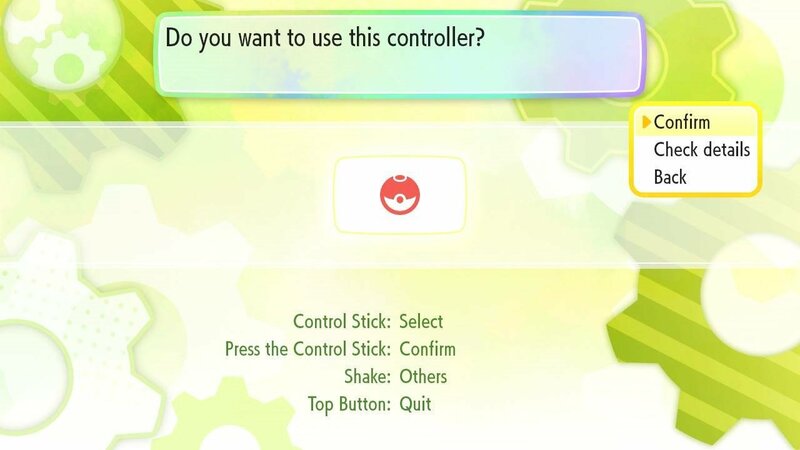 First, when you boot up the game, you have the option to choose whether you want to use the Joy-Con controllers, or the Poké Ball Plus as your controller. If you’re not a fan of the one-handed controller setup of the Poké Ball Plus, you can select the Joy-Con option and link the device later. Tap the button on your Poké Ball Plus, then confirm by tapping the button again to use the device as a controller in Pokémon: Let's Go. To pair the device later on, you’ll need to tap “X” to open your Menu, then “Y” to bring up the “Options” screen. From there, choose the “Open Controller Settings” option. Here, it’ll ask you to tap a button on the controller you wish to use. If you wish to use the Poké Ball Plus, tap the button on the device, then confirm you wish to use it as a controller in Pokémon: Let’s Go. After that, your Poké Ball Plus will be paired with the game! Open your Settings, then choose the Poké Ball Plus. Tap the button on your Poké Ball Plus to begin the pairing process, then click on the device once it's discovered to connect it to your Pokémon GO account. To pair your Poké Ball Plus to your Pokémon GO account, you’ll first need to open the Pokémon GO app on your mobile device. Once your game has loaded, tap the Poké Ball icon, then select “Settings” from the upper right corner. 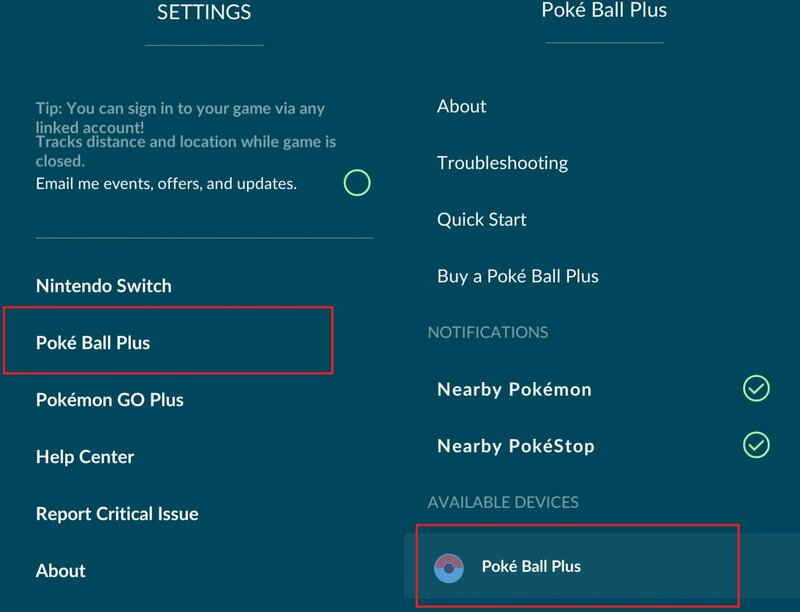 Scroll down through the settings until you find the Poké Ball Plus option. Tap the button on your Poké Ball Plus until the light beings to pulse, then at the bottom of the screen wait until the Poké Ball Plus shows up on your list of available devices. Select the Poké Ball Plus when it shows up, then select “Enable” to pair your device. After that, your Poké Ball Plus will be successfully paired to your Pokémon GO account. 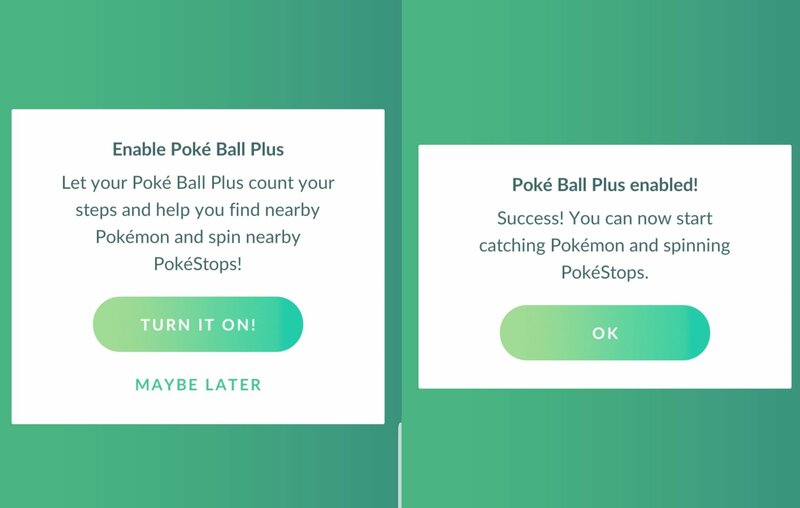 Confirm that you want to turn your Poké Ball Plus on in Pokémon GO, and you can begin using the device to catch Pokémon! Keep in mind you don’t want to attempt to pair the device with your phone and Switch if both are right next to each other. We did this, and the Poké Ball Plus wouldn’t appear in the list of available devices on our phone. When we walked away from the Switch with our phone and Poké Ball Plus, the device immediately appeared on the phone and we were able to pair it. 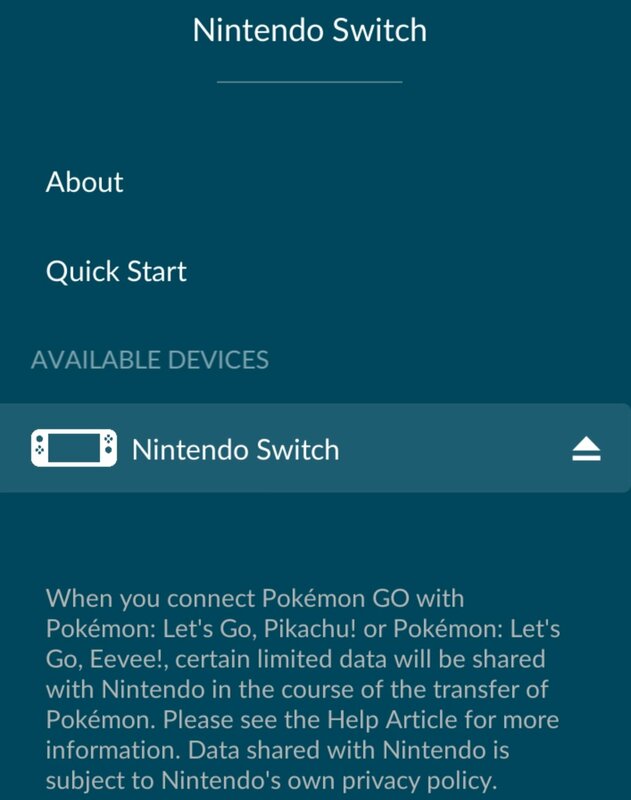 To connect your accounts, open your Pokémon GO app, tap the Poké Ball icon, then select Settings and find the option for Nintendo Switch. To pair your Pokémon GO and Pokémon: Let’s Go accounts, you’ll want to start the pairing process on both devices. First, open your Pokémon GO app on your phone, tap the Poké Ball icon, then select “Settings” from the upper right corner. In Settings, scroll down until you find the “Nintendo Switch” option. Next, tap “X” to open your Menu in Pokémon: Let’s Go, then tap “Y” to bring up the “Options” page. In Options, select “Open Pokémon GO Settings” and tap “A” until you reach the screen asking if you want to pair a Pokémon GO account. Select “Yes” then select “Connect to Nintendo Switch” on your phone. When it finds your account, it’ll ask you to confirm you want to connect your accounts. After accepting, you’ll get a screen confirming that you’re connected to your Pokémon GO account, and can transfer Pokémon from GO by visiting the GO Park complex in Fuchsia City. Open up your Menu in Pokémon: Let's Go, then tap "Y" to open your Options. In Options, select "Open Pokémon GO Settings" and begin the pairing process. For more on the Poké Ball Plus, be sure to check out our previous guide on what it is and where you can buy one! For more on Pokémon: Let’s Go, be sure to check out our guides on what your Rival’s name is in Pokémon: Let’s Go, all rideable Pokémon in Pokémon: Let’s Go, and how to transfer Pokémon from GO over to Let’s Go. By reading through this guide, you should now know how to pair your Poké Ball Plus to Pokémon: Let’s Go and Pokémon GO.